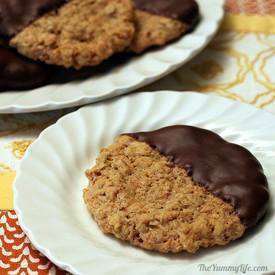 This is a fast and easy way to turn an ordinary oatmeal cookie into an extraordinary, elegant and totally yummy treat. For you chocolate lovers, this one will make your heart go pitter patter. The combination of the nutty crunch of the cookie and the smooth, rich chocolate is hard to beat. Although, I must admit that I would probably like cardboard dipped in chocolate.